21 st March marks an important day in every anti racist’s calendar. On that day in 1960, police opened fire and killed 69 black people at a peaceful demonstration for equality and against apartheid laws in Sharpeville, South Africa. This date has since been declared the The International Day for the Elimination of Racial Discrimination, when the people across the globe show their opposition to racism and solidarity with those affected by it and in remembrance of the harmful impact of racism on individuals and communities. In ENAR Ireland we will coordinate and celebrate not only that important day, but entire two weeks full of anti racist events between 14th and 30th of March. The week predeceasing 21st March (14-22 March) is the European Week Against Racism and the following week (21-28 March) marks the Week of Solidarity with the People Struggling against Racism and Racial Discrimination. 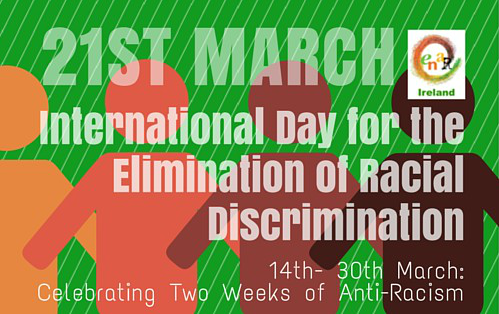 Over these two weeks ENAR Ireland and our Network’s Members will be hosting a range of events across Ireland focusing around The International Day for the Elimination of Racial Discrimination. Check out what’s happening in your area in the below Events Calendar and join the celebration. NUIM Launch of iReport.ie in celebration with NUIM and MUSU. Our Director Shane O’Curry is one of speakers at a lunchtime event in the Maynooth University organised by HR Equality, the Department of Applied Social Studies, and the Students Union in advance of International Week Against Racism, as part of Maynooth University’s Equality Strategy. Members of the Justice for the Undocumented Campaign (JFU) are inviting friends and supporters to join with undocumented migrants. A powerful message is being sent to Taoiseach Enda Kenny on his journey to Washington as a massive banner with a message of solidarity for undocumented migrants on both sides of the Atlantic is dropped down the front of the building. This is to correspond with the final days of an email campaign reminding the Taoiseach about the situation facing undocumented migrants here in Ireland as he advocates for change for undocumented Irish in the USA. If you haven’t yet sent your message to An Taoiseach, send it now before Monday! It is a family friendly event with a photo booth, face painting, music and some refreshments. Join JFU on Sunday, take a picture with the banner – share it on Facebook with friends and family. In addition to the training dates above we offer in-house training as well as tailored training courses designed to meet the exact needs of the client organisation (see attached brochure). SARI’s programme opens up in the Mosney Direct Provision Centre where there will be an exhibition football game involving boys and girls from Mosney and players from SARI ‘Soccernites’ and ‘Hijabs + Hat Tricks’ programmes followed by presentation by HSE Community Games of Sports Equipment to Mosney and eleven other Direct Provision Centres nationwide. The donation of equipment will facilitate the ‘Provide for Sport’ joint venture involving SARI, HSE Community Games and the Global Institute of Physical Literacy at DKIT, Dundalk. Patron of ‘P4S’ is Irish International footballer and former resident of Mosney, Oscar Sibanda. It is an event geared towards Transition Year students in Cork to mark the International Day for the Elimination of Racism in a fun & educational way. It aims to raise awareness about the impact of racism & develop an anti-racism dialogue among young people and be a showcase for new & emerging talent. Red FM’s Stevie G will be our MC on the day and an announcement on acts will be made soon. Republic of Ireland against Racism invites you to join our online town / area selfie campaign # your self , your town or area with : #………..saysNotoRacismMarch21st. This is an online event .Please post your photos/selfies here on this event page, our anti racism group page or our twitter page. Tag a friend and invite them to join our campaign . An event highlighting racism and discrimination for different minority groups. A march will take place and there will be speakers on issues of racism. A great event to raise awareness of racism within our society and how we can work towards eliminating it. Come and show your support. 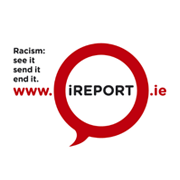 As a part of the International Day for the Elimination of Racial Discrimination celebrations ENAR Ireland will have an information stand on reporting racism and iReport.ie during Islamic Foundation Ireland’s Health Screening Programme. A fundraiser for Anti Racism Network Ireland. Are you not racist? Do you love music? Join us! We’ve got a stellar local lineup of musicians & DJs playing reggae, afrobeat, hip hop & lots more. Tickets €5/10: arnfundraiser.eventbrite.ie. All proceeds go to ARN. A seminar on racism with an emphasis on training and getting buy- in on reporting mechanisms from service providers attending. The launch of ENAR Ireland, SIPTU and ICTU’s Project ‘Face Up to Racism’ with Chief Human Rights Commisioner Emily Logan.